Hello! How are you? How has your summer been? I hope it’s warm and dry where you are, and that you’re finding the time to read books in the sunshine with cold beverages. Please tell me you’ve been enjoying long, warmly lit evenings of leisure because I need to live vicariously through you. I have been spending most of my time in front of screens, stress-eating simple carbs and not-fitting into my clothes. Writing a book is fattening, and sooner or later I am going to have to stop testing my fried chicken recipe. Or I guess I could buy a whole bunch of colourful caftans? I think waistbands are why I am so curmudgeonly in real life. This has been an intense summer, and I am very tired. There was a long stretch of 2012 where I was very unsure of myself, as I was suddenly unemployed and had a hard time finding work while we ran out of money but still had to pay for daycare, lest we lose our spot. (Daycare in Vancouver is a pretty big issue, where the cost of daycare over four years generally costs more than a university education. There also aren’t a lot of spots.) It didn’t seem like there were any opportunities, and I felt very much like a failure as I was passed over for job after job after job. I am trying to remember that now, as just two years later I’ve recently been offered more than my share of great opportunities, and in addition to this book, which has been my goal for as long as I’ve had a kitchen and a computer, I’ve just accepted a shiny new job. have reassure me. Nick isn’t saying anything about the number of doughnuts I’ve eaten (I can’t say the same for the cashiers at Safeway, where I buy my deep-fried maple-bacon feelings-vehicles), which makes me think it might work out with him long-term. According to Nick: “That’s surprisingly good. I’m actually really surprised.” I add a lot of value to this relationship. It’s a mix of orange pop and cheap red wine, and you drink it cold and it’s enough like sangria to pass on a hot summer day when the store seems so far away and dressing your lower half seems like an impossibility. If you are fancy and have that good San Pellegrino Aranciata on hand, or a bottle of Orangina, this would be an inch shy of amazing; with Orange Crush or C-Plus, it’ll do, but in a good way. You could drink this with a bowl of Miss Vickie’s salt and vinegar chips and it would be a pretty great afternoon. None of this was actually my idea – I don’t really know where it came from but I went to a friend’s house a couple of weeks ago to sit in the sun and watch our kids run through the sprinkler in her back yard, and she said “I heard in Spain they mix red wine and pop,” and I was like “yes, I know of this. They mix it with Coke.” “BUT NOT JUST THAT!” she declared, and soon her husband was sent off to the supermarket for a couple of two-litre bottles of pop so we could do some science. We went with the red wine and orange pop, because of course and/or why not? And it was, as Nick says, surprisingly good. Would it be as good in December, indoors while wearing pants? Probably not. But who cares about then, we must live in the now and the now is about refreshment and simple alternatives to effort and going out. I looked it up after, and she was right – this is a real thing, in Spain, which is a place neither of us has been to. 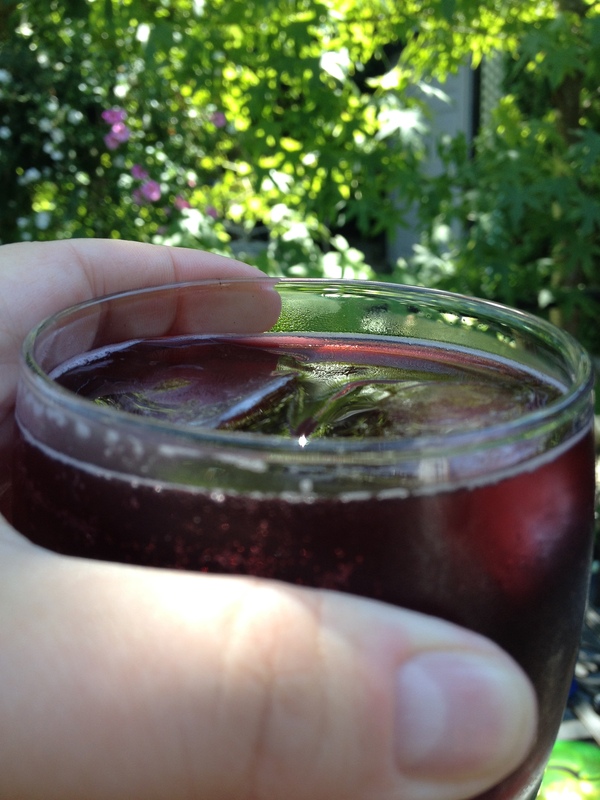 It’s called tinto de verano, and I don’t care if only teenagers drink it. So what’s the recipe? There isn’t one, really; just pour equal parts red wine and orange pop into a cup with ice. How much? That’s up to you; I use a short glass so I feel like a responsible parent (even if I refill it six or ten times). What kind of wine? Whatever kind – a shiraz is nice, and so is whatever’s on sale or left over in your fridge from some other evening. Pour your drink, then take off your pants. Sit down outside. Put your sunglasses on your face. And just go with it. Go with it all afternoon, until the light fades and you get that wistful “forever summer” feeling and start posting heavily filtered photos of each drink to Instagram. As one does. Relax. You’ve earned it. We all have. What are you drinking? I need recipes that don’t require a trip to the store. < Previous A big, exciting thing. This may be my favorite post you’ve ever written. Cudos to you! My sangria recipe consists of a heavily steeped loose leaf fruit tea of some sort (berry flavours are great, as well as anything vanilla-y) mixed with cheap red wine & a splash of OJ. I like to trick my mind into thinking that I’m being healthy by drinking “mostly water….because of the tea”, kind of like how I also think that drinking vodka + water + a splash of lime counts towards my optimal water intake for the day. Jesus, that would have haunted me for all of eternity. Congrats on the new job and the cookbook, by the way! You guys are nice 🙂 thank you! at the McBritchell household we call drinks “rum-coco’s” mostly because it makes any drink sound fun but also as an ode to Ava Gardner’s character in “The Night of the Iguana”. rum-coco’s are anything, but are mostly vodka, coke zero, and a dash of amaretto. sometimes they are also ginger ale, tequila, and lime. 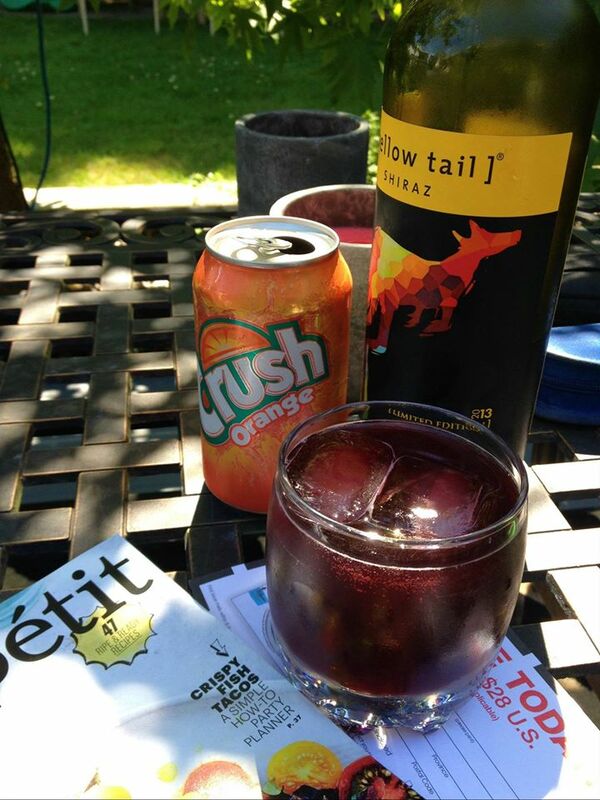 i’m pretty tempted to try your sangria recipe this weekend—i haven’t had orange pop in ages! Apropos of nothing, well something, I’ve heard for DECADES, yes decades, that orange crush is, in fact, the secret ingredient to great sangria. As for easy, I was forced to serve bitters one night at a progressive dinner party (we were on dessert) and found out that Argentinians just add coke! Hola!